"The General" raised to 4,100 on the button. The player in the small blind shoved all in for 20,700. The big blind folded, and General called. The board ran out [qd][10d][9h][7c][8d], eliminating The General's opponent just after the rebuy period has closed. The clock has been paused in Flight A of Event #11. The players will play three more hands before bag and tag for the night. At the present, there are 37 players remaining. The players in Flight B are playing Level 4, and will play through Level 12 before bagging and tagging for the night. Nick McDonald shoved all in and Brad St. Vincent said, "I told you I would call you with ace-queen. I call," He turned over [ad][qc]. McDonald showed [kh][qd]. The flop came [2h][kc][ks]. St. Vincent semi-jokingly said, "I have a straight draw." The turn was the [8s], and the river the [5s] giving McDonald a full double. He is now sitting with 16,000. Two players in middle position limped in for 2,400, and Chris Castronovo made it 6,000 in the hijack. The player on the button called, and did both limpers. All players checked the [ad][7c][2h] flop. When the turn came the [2s], the player first to act bet 6,000, the person in middle position folded, Castronovo called, and the button folded. The river came the [5s]. The first player checked, Castronovo shoved all in, and her opponent tank folded. Castronovo is now sitting with around 65,000 in chips just before dinner break. We are now in the third level of Flight B and there are 72 runners that have entered so far. There were 142 entrants in Flight A this morning at 11am. As a reminder, registration is open for this event until the beginning of Level 10. There is a $300,000 guarantee for this event. Day 2 will be at noon tomorrow (Sunday Oct. 11th) and Day 3 (Final Table) will be at noon on Monday Oct. 12th. There were 97 entries in today's $250 Ladies event, generating a prize pool total of $20,229. A player in early position shoved all in and Liz Kasparian called. The board ran out [ad][ah][2s][kc][5h], sending her opponent to the rail and chipping Kasparian up to around 40,000. 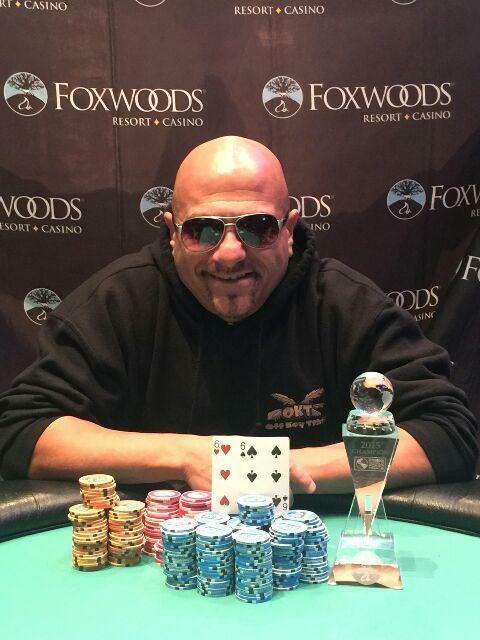 Congrats to Tony Sabbagh, the recent winner of Foxwoods World Poker Finals Event #6, the $300 NLH Bounty Tourney. The final four made a chop deal and then played it out for the trophy and title. "The General" shoved all in preflop and was called by Brad St. Vincent. The flop came [6c][as][3c], giving St. Vincent the lead with his set of sixes. The [8c] turn and [js] river did not improve The General's hand and he was sent to the rail. Priscilla Amaral raised to 450 in early position and the player directly to her left called. The flop came [qs][10h][2c]. Amaral bet 800 and her opponent called. Amaral bet 1.200 when the turn came the [kh] and again her opponent called. 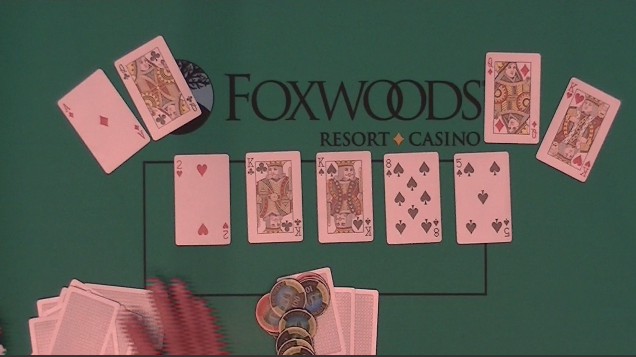 When the river came the [qh], Amaral shoved all in and her opponent folded. Amaral showed [ah][jh] for the royal flush. Foxwoods 1200 today, first tourney in a long while. 21425 at 25-50 thanks to aces the first hand. There are currently 72 runners in the Ladies World Poker Finals Event #10. They are playing 50/100 antes. After a chop deal between the final three players, Joe Heinzmann would claim the title of Event #9 champion and the trophy. After a long heads up battle, Mike Borchetta became the eventual winner of Event #8. The players did come to a chop deal when they were five handed. But it was Borchetta who ultimately claimed the trophy and title of Event #8 champion. David Kluchman shoved all in holding [6d][5c] and was called by Mike Borchetta holding [as][5h]. The board ran out [9h][8h][4h][jc][qd]. Borchetta's ace high took down the pot and Kluchman is the second place finisher. Mike Borchetta limped in on the button. David Kluchman shoved all in and Borchetta snap-called. 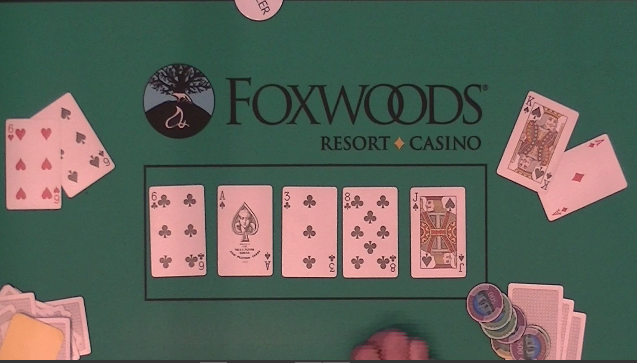 The board ran out [qd][ah][4s][kc][5d] to give Borchetta the chip lead and leave Kluchman with less than ten big blinds.